This book was especially entertaining from me because a lot of it revolves around one of my favorite areas, Ann Arbor, MI. The author has lived, worked, and ran in Ann Arbor at different times throughout his life and running career, and shares many of those stories within the book. 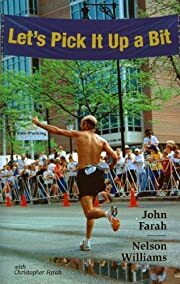 Let’s Pick It Up a Bit is basically the story of the author John Farah’s running journey from beginning until current times. Not only did the setting help me enjoy the book, but I felt connected to the author as another essentially regular-joe, amateur athlete who wants to train hard and push his own limitations. He shares lots of training and racing advice, as well as lots of stories from the races and places he’s ran. While the book is of course a story of his own journey, Farah helps to relate much of the book to the reader–sharing lessons learned and tips to help the reader run hard and happy. Whether you’re from mid-Michigan or not, but especially if you are, I’d definitely give this book a gander. It’s both an easy and enjoyable read.